Tom Robertshaw, a UK Magento developer just released the latest result of his quarterly eCommerce survey. The survey found 35,218 sites in the Alexa Top 1 Million that are doing eCommerce and analyzes which platform is being used. 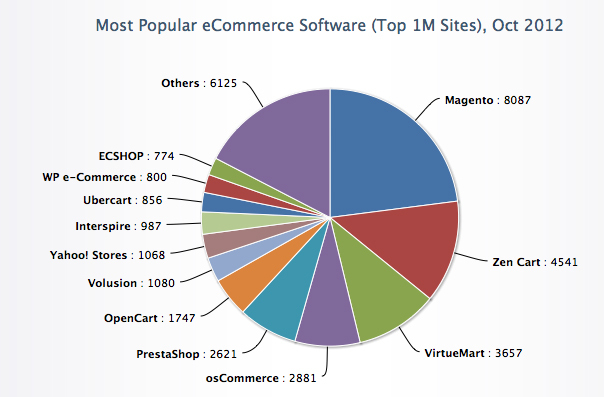 According to survey, Magento topped the study with a 23% share in the market, as the leading eCommerce software platform. Magento has seen growth in every single edition since the survey began 2 years ago. Zen Cart also shares a big growth to 12.9%. Following these two top platforms are VirtueMart and osCommerce. Moreover, both PrestaShop and OpenCart take a dip in numbers. Despite of Tom Robertshaw apology for the delay of the released for this edition, we are very thankful for creating this valuable tool. We can now easily choose what eCommerce platform to use and be knowledgeable about the solutions that are available to the market. Thanks to E-commerce, we can buy without experiencing the waiting-line in a store. E-commerce is evolving and now we heard “social commerce” which starts to take hold and loyal customers to promote a brand and store. To build an easy-to-use shopping experience, you must choose a web-based application that can offer a diverse set of tools and components. To start the list, I chose paid carts and free offerings. There are a large number of good, free, open source shopping carts out there, but this review is the top-choice of e-commerce clients.